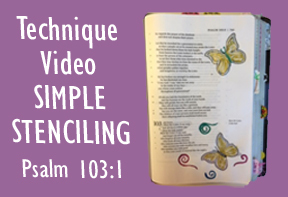 Do you need a surefired way to draw ordinary images as the base of your Bible Journaling artwork? Watch the video and read below to learn the 3 simple steps to fantastic drawings, no skills needed. STENCILS ARE THE ANSWER! 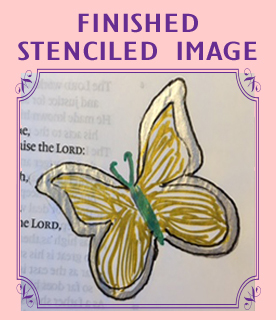 After you decide what kind of image you want to draw in your Bible, find a stencil set to assist you. Stencils are plentiful on Amazon, any hobby shop or school supply department. I have used a butterfly stencil for this tutorial. Step #1…TRACE WITH PENCIL! After positioning stencil on your Bible page and using a regular pencil, carefully trace around the plastic image. Step #2… FILL IN IMAGE! Decide what medium you will use to color your image (colored pencils, Illustrator pens, watercolor gel crayons, etc. First re-trace the original pencil lines, and then fill in. CALL TO ACTION… Once you have completed this Project Challenge of using stencils, please go to our Facebook Group Page and share your Art from the Heart. AFFILIATE LINKS TO AMAZON… Makes shopping easy for your CBJ trusted Bible Journaling Supplies. Cost nothing extra for you. Helps us fund our ministry, sharing Bible Journaling with the world. Loved the video … I’m going to try this today! Susan, the video was so nice! Linda, I’m thrilled you like the stenciling technique and my video! This was my very first video tutorial and it’s the one I go back to time and time again. Why? Because I want to show everyone that whatever “talent” they may or may not “feel” they have, every person on the globe can enjoy “The Art of Worship! One little bit of advice I can offer is to place a piece of scrap paper behind your Bible page to protect the page behind your stencilling. This will protect the page behind it from bleed through from the gel pens. Also, from leaving indentations on the page from pressing down on a soft surface of the multiple pages. That scrap paper protects your page behind the one your drawing on. Hope that makes sense! Thanks Tammie for the advice. Actually having a protective piece of thin plastic or cardstock paper is suggested for any journaling activity. Thanks for bringing this up. I will remember to mention it on future projects.